The Big Temple, Thanjavur - India's Greatest Architectural Wonder! A magnificent glory of Chola! 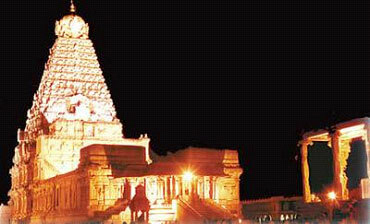 Welcome to the website of Rajarajeeswaram, the Big Temple in Thanjavur, Tamil Nadu India. The first question which comes to anyone is why another website when there are so many on the temple. The reason we launched this website was to let the world know of the chola architetectural and engineering skills, the sculptural and painting marvels and of course the careful planning and execution involved to build such a magnificent monument. We strive to have a site which will be the complete focus point on all the aspects about the temple including its planning, execution, administration, architecture, sculptures and paintings. We also would elaborate on how the temples were not only religious sites but also a haven for archaeologists. The Big temple of Thanjavur was called as Rajarajeeswaram , abode of the Lord of Rajaraja Chola or the Temple for Lord Iswara built by Raja Raja Chola the great. With the fall of the Cholas, Thanjavur was resurrected by the Nayaks and Marathas during that time frame the name was sanskritised and called Brahadeeswara temple. Today the world knows Rajarajeeswaram as the big temple or Brahadeswara temple, an UNESCO world heritage monument, but what the world does not know is about the all round skills of its builder Rajaraja Chola the Great, The architectural intricacies of the temple and the sculptures and arts which have lasted a millennium. We strive to bring to light the way of life a thousand years ago and the way the big temple was built and how it has changed though the last thousand years and its state today. What we have endeavoured to start with the big temple will continue to other South Indian monuments to show the wonders of ancient arts and architectures of South India.